Just another name for ravioli, really, although some are cut in circles. Mantua is known for squash or pumpkin-filled tortelli, tortelli di zucca. Tortelli d'erba, or tortelli verdi from Emilia-Romagna are filled with spinach or chard, and cheese, and served with melted butter and sage. 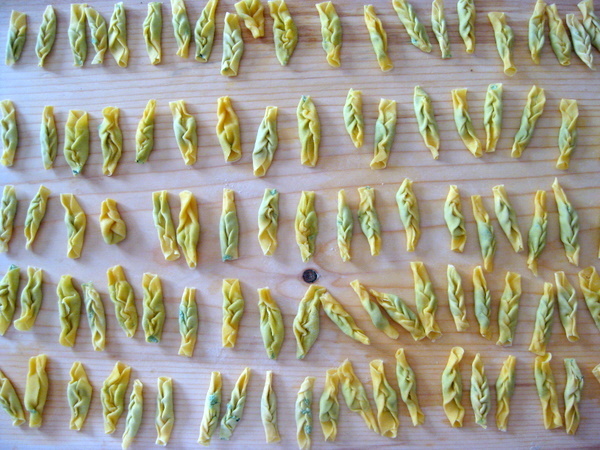 Tortelli piacentini are similar but shaped like bonbons, but they also make tortelli con la coda (or cun la cùa), that looks as if they are woven almost, with a tail on either end. They take them seriously in Crema, as a dish for holidays and special events. There is an academy dedicated to the local tortelli cremaschi, stuffed with amaretto cookies, raisins, cheese and lemon. Similar tortelli with sweet fillings (some fried) are made in many regions during carnival. In the Marche they make tortello al rosso d’uovo, stuffed with ricotta, spinach, and egg yolk, in a light tomato and basil sauce. Just to make things confusing, sometimes you will see tortellini or tortelloni called 'tortelli' (or even tordelli). Toricelli, their cousins, are semi-circular and filled with meat and popular in northern Tuscany. There are also sweet torelli, filled with jam and fried. Little Sagginale, near Borgo S. Lorenzo north of Florence, honours its favourite pasta with a Sagra del Tortello in June and August.